You are right I have memorized the piece shapes, this will make things interesting. Very good! I think I will like this. So happy for the new feature. The puzzles will be much more fun to play. Thank you. I have been waiting for you to do this- thanks! Sounds great hope it works out!!! I just finished todays puzzles and saw right away the cuts were different that is so great, makes ya think!!! Have a good day. Great idea! Many thanks, for the new feature on our c4j! I'm sorry that I have to admit that I really like the old way. Going to give this way a good try and see how I do before I stop playing. I always started my day off with the classic cut puzzles. Thanks. Mulebreeder13 - I urge you to play the new cuts for a while. I think you'll really like them and enjoy the challenge of a brand new cut every time. If you still prefer the old puzzle cuts, you can disable dynamic cuts in your account settings. Can't wait to try this is new challenge. I love puzzles! You have a whole lot of Interesting puzzles,Keep making more. I am happy about this. I was ready to stop this puzzle link because it is no challenge. Thank you! I am one of the solvers who has memorized all the cuts I can do. So all I do now is tesselation. Now I can do regular cuts as well. Wonderful! Good idea, will probably give more fun. love it take a while to get used to large cut then small but I will master it love puzzles and do 3 each morning and 3 each evening--relaxes me to no end. Keep them up and keep adding new photo's to do. I will let you know once I have completed one. I love doing the puzzles, but as you say it does get to the point that you know where each piece goes. I, however, don't do the puzzle for timing to beat others, I play because I like to do puzzles. Yeah!!! More of a challenge. I think that this is great, as I have remembered most of the puzzle cuts. Thanks. Good idea. I have not been playing for long, but I was already noticing the patterns of the shapes were repetitive. Keeps us on our toes! Love getting a new puzzle each day. This will make it more fun. Grand idea! I have memorized the shapes. Will be more challenging. Just did a couple puzzles with new cut. Really like it. Some how seemed easier, but time was pretty much the same. Don't want to get to fast, someone has to come in last!!! Disabled mine, I do not take change well..., but will try it on a day when I'm not stressed to began with. The one thing I noticed when I joined this site was that the classic puzzles were just like the ones you buy in the box. So many of the sites has what they called classic but they were not the shape that was my idea of a classic shape. I know change is good and was happy to see we could to either type and I will try the new type at another time...always glad to see new features. I play puzzles everyday. I am happy to see the change in the puzzle cuts. It is true that the same cuts for every puzzle was becoming boring. That is wonderful. I play every day so it will be nice to have different shapes. Thank you. A very satisfied customer. Have not tried your new cuts as yet but the do say a change is as good as a rest will look forward to yet another challenge.Santa. Yes, it was getting too easy. Thanks for changing and challenging us. Great idea. It was really getting boring. I'm excited to try the new cuts also, and think it is a great idea. Will we be able to go back & forth with the disable/able function? Patricia100 - Yes you can enable/disable the dynamic cuts whenever you want. We'll be keeping the old puzzle cuts for whoever wants to keep playing them. I am excited. I love a little challenge. I just tried the new puzzle cut and the one that appeared was the bottom one shown in the pictures above. I am not sure why but the curved parts of the pieces seem to make me somewhat dizzy! I changed back to the original so this feature does not seem to work for me. Glad it works for so many other people. Thank you. Bethohm - I'm sorry to hear that the new cuts make you dizzy, but thanks for giving them a try! Nice going.. I look forward to the new shapes of the pieces. Bravo! It may even take a while before those champions of each cut, those who run circles around the rest of us in their solve times, memorize the new cuts! I also think it is a marvelous change, and I'm sure many others have also wished for different puzzle cuts for quite a while. It is also very bright of you to allow folks to switch back to the old and comfortable cuts. But I, for one, thank you, thank you, thank you!!! I'm so happy you've done this. I love doing the puzzles the way they are presented, although it's nice to have something different for a change! Keep up the good work! Noeline - Yes, this feature is available to everyone for free. Played the new classic and wavy puzzle cuts on and off today, and they are fun, different and somewhat challenging. My only suggestion would be that you create either a parallel count for classic and new cuts for same-numbered and style of puzzle or start a new times-posted area for the new cuts. For Premium players who want to really challenge themselves, of course, there's always the rotation of pieces option. I agree with you and I do look forward to the dynamic puzzle cuts! Jbu This will make puzzling a bit more challenging and a lot more fun!!! Thanks:) This will be great:) I also like we can go back to the old static puzzle cuts:) Thank you:) I really enjoy Crazy4Jigsaws! Really like the new shapes. I think this will make the puzzles much more interesting! I have not memorized the pieces, gosh---I'm not that good...but I do like the idea of a different "look". Keep up the beautiful puzzles---I am here almost every day and never get tired of doing your puzzles! YES! Before I had bought a membership I would play the same classic puzzle piece game and yea I was beginin' to remember it. Thank you. Love the new puzzle cuts. Thank you. This is a great idea. Occasional changes are usually good. Many thanks! It's an interesting concept, although your standard puzzle cuts keep me occupied well enough as the 500 pieces seem really small. I'd like a TV size monitor so I could try the largest. I do enjoy your puzzles. I love the changes. It can get boring doing the same ting all the time. Thank you team Two thumbs up. 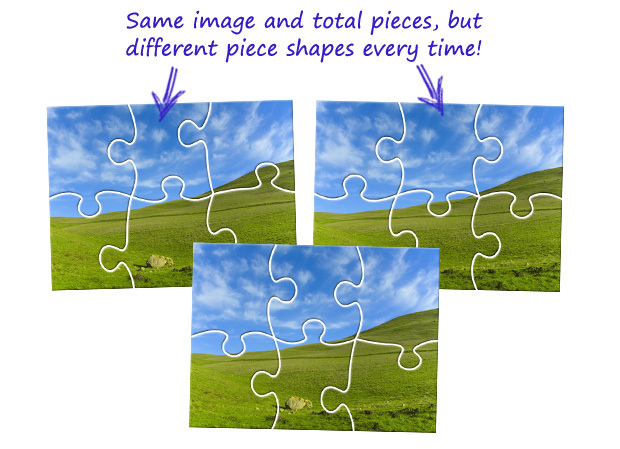 Super change - - this is what puzzling is all about!! Thank you. Thank you for the new challenge! I'll admit it... I'm one of those who had memorized the shapes and their locations and rarely used the picture as a clue to placement of each piece. The new puzzle cuts make me use a full range of puzzle-solving skills to complete the picture. And that's good for my mental agility. Thanks! this will be interesting. i was getting bored with the same puzzle cuts. I do have a question, how does it effect you puzzles that you have saved? Will they all change or will they stay in the format they were done in? CatLadyOKC - Great question! Dynamic puzzles that are saved will always re-open as the same cut shapes that you originally started with. The puzzle won't change shape in the middle of solving it. This is a great enhancement. Even in the 300 piece puzzles, I have learned the pattern in the second row from the top. Thanks so much for improving our experience! Excellent! Challenges the brain! So important to keep us alert! Salamat! I'm so happy to hear about this new feature! I just love your puzzles especially the plants and flowers categories. Beautiful and colorful which makes the finished puzzle so dynamic and real. One suggestion though, could you also make different shapes such as trees, balls, cars, etc.? It is more of a challenge to complete. I just love these puzzles. Thank you so much for providing a way to get my brain healthy.